Surprised just one game on a Saturday evening, But i am sure none was disappointed has we had a run fest in Delhi. Languishing in the bottom of the table Delhi certainly needed something spl to bring their sprits up and it was the day, Gilly won the coin and felt something is there for bowlers and went for chase and it did show how well they misread the pitch. Shewag and Warner amazed 146 for first wicket, before Shewag wanted 6 sixes in an over got caught in long on. Warner, Venugopal Rao, Ojha, all did their part to get Delhi to their highest ever total in IPL so far. 231/4 in 20 overs, Chasing almost 2 runs a ball right from the start is very tough but Punjab was in no mood to give up, as Gilly and Marsh kept going and found the crowd profusely, esp the latter. As said, it wasn’t easy though KXIP came very close to that, by reaching 202/6 in 20 overs, not a bad chase though. Finally Delhi will have a reason to smile after losing three games on a trot, still they are right in the bottom but not by much. Very soon this table will turn on its head. Watch out guys. Delhi won the game by 29 runs. – 146 runs between Shewag and Warner is the highest ever first wicket partnership in the IPL so far for Delhi Daredevils. – 146 runs partnership is also the highest ever fourth partnership for any wicket in IP so far. 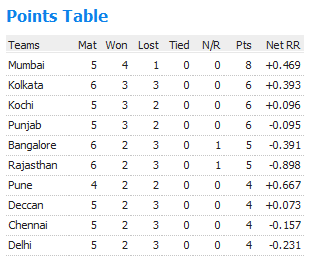 Highest was by Gilchrist & Laxman 155 runs Vs Mumbai in the first season of IPL. – Today’s Match is the 200th IPL game game. – 7 Aussies played the game today (Warner,Finch,Hopes, Gilchrist, Shaun Marsh, David Hussey and Ryan Harris) which is also the highest in terms of Foreign player taking field from a same team. – 231/4 is the third Highest total in IPL History so far, previous others by Chennai 246 Vs Rajasthan and 240 Vs KXIP. – Gilchrist scored the 700th Boundary of IPL 4. – 231/4 is also the highest score of this season previous was 195/7 by KXIP. – 12 sixes scored by Delhi is the highest no.of sixes scored by any team in this season of IPL so far, previous was 11 sixes by Pune Warriors India. – David Warner becomes the 4th batsmen of this season to barge into 200 run club, with 77 runs today, he is with 229 runs to his name. – David Hussey first ball of this season IPL was bludgeoned by Shewag for a six, and much-touted Varun Aaron’s First ball was rocketed to boundary by Shaun Marsh. – David Hussey Bettered Gayle in the distance travelled by a six, Hussey’s 2nd six of his innings went for 106 meters which is the longest ever for this season, next ones are 105 by Shaun Marsh and 104 by Chris Gayle. – 443 runs aggregated by both teams is the highest ever for this season. – 23 sixes in a match is also the highest numbers hit, bettering 20 sixes by PWI Vs DD.